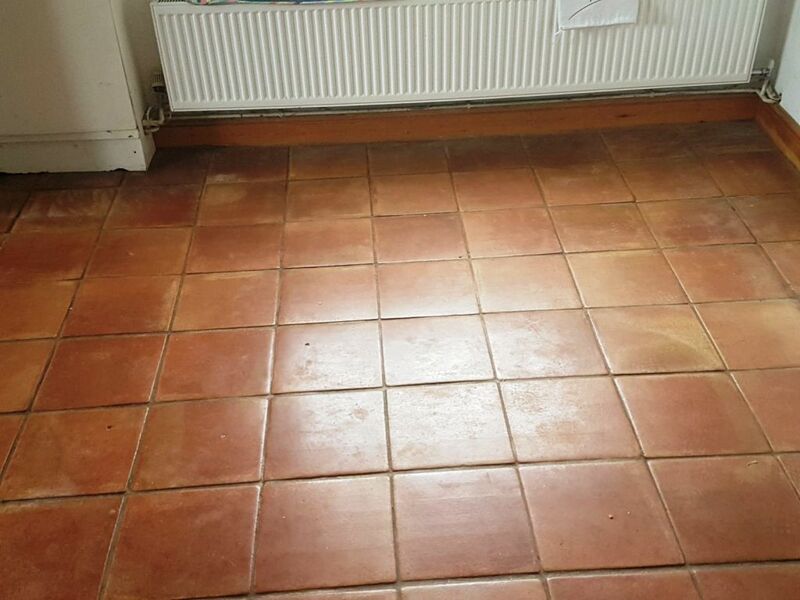 This couple, who live in the seaside resort of Brighton, had purchased their house four months before Christmas and wanted to have the fantastic Terracotta tiled floor in the kitchen and conservatory looking its best before the festive period, since they had family visiting. The floor was looking washed out and it was clear the sealer had failed in the high traffic areas and was now allowing dirt to penetrate into the pores of the tile making it difficult to clean. We often get calls from new home owners keen to put their own stamp on a property shortly after moving in; stone floors rarely come with cleaning instructions so if you have a stone floor it makes sense to get in touch, so we can advise you on how best to maintain it. 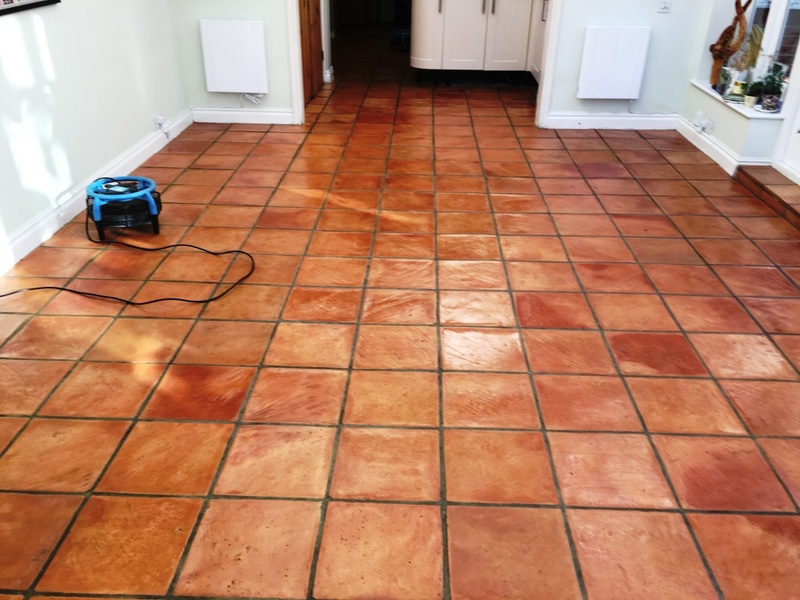 We provided a quote which included stripping the floor of old sealers, cleaning, oiling and then sealing it again to restore cleanliness and character to the Terracotta. There was a lot to do and two areas to clean so I anticipated it would take four days to complete. 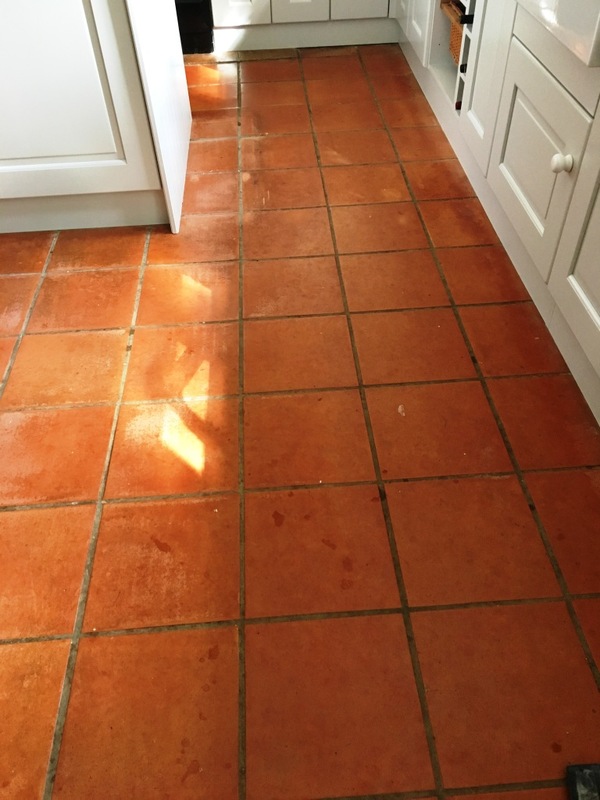 Having accepted the quote our first task upon returning to the property was to give the Terracotta tiles a deep clean and remove any remaining sealer present on the tile. This was achieved by applying a strong combination of Tile Doctor Pro-Clean and Tile Doctor NanoTech HBU to the tiles and then covering it in a plastic sheet, so it wouldn’t dry out. This method allows the products to really soak into the pores of the Terracotta and draw out the dirt. I should also mention that Pro-Clean is a very effective Tile and Grout cleaner whilst HBU enhances it by adding nano-sized cleaning particles. 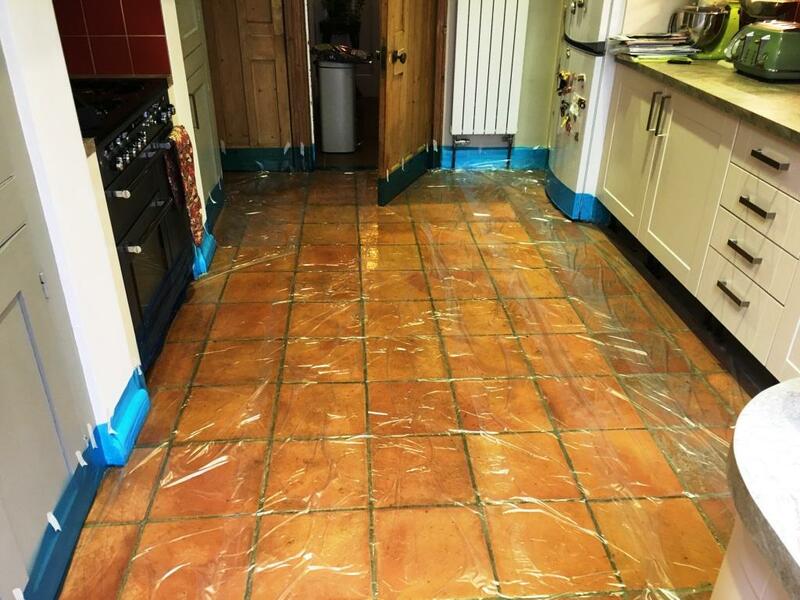 The plastic blanket was left in place for a few hours before being peeled off and then the cleaning products scrubbed into the tile and grout using a black pad fitted to a rotary floor machine and hand brushes. The now soiled product was rinsed off with water which was then extracted using a wet vacuum. The floor was inspected, and stubborn marks spot treated until the floor was clean. After thoroughly cleaning the Terracotta over two days, we left the floor to completely dry off over the weekend. 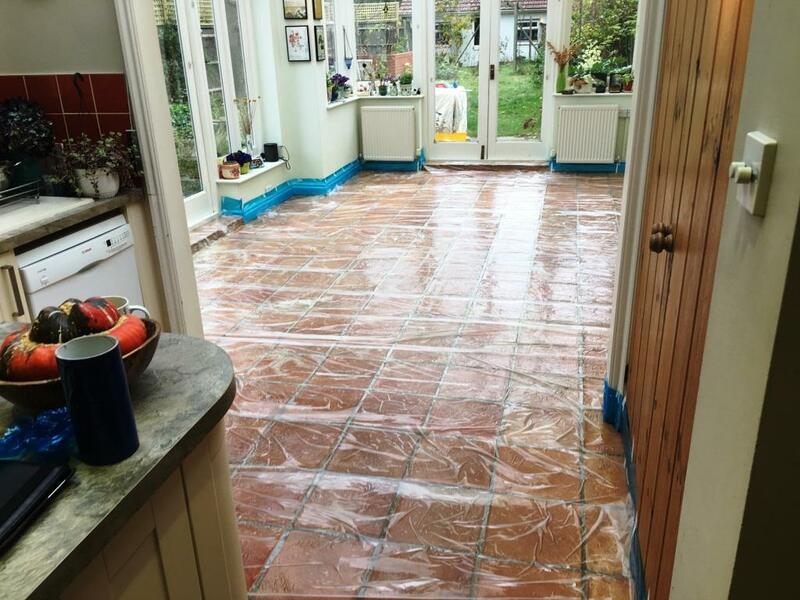 The tiles would need to be sufficiently dry to receive fresh sealant, as excess moisture can cloud the sealant and prevent it from working correctly. 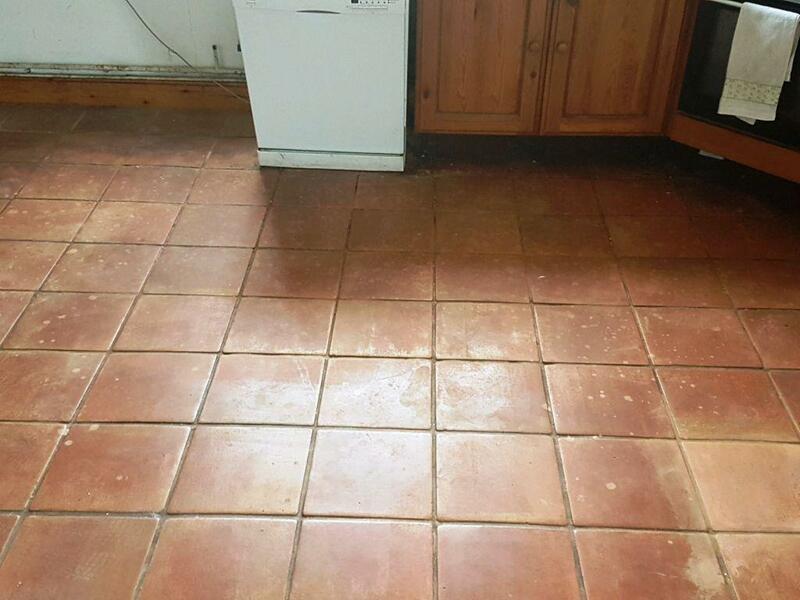 When we returned to the property, we proceeded to apply Tile Doctor Stone Oil to the tiles. 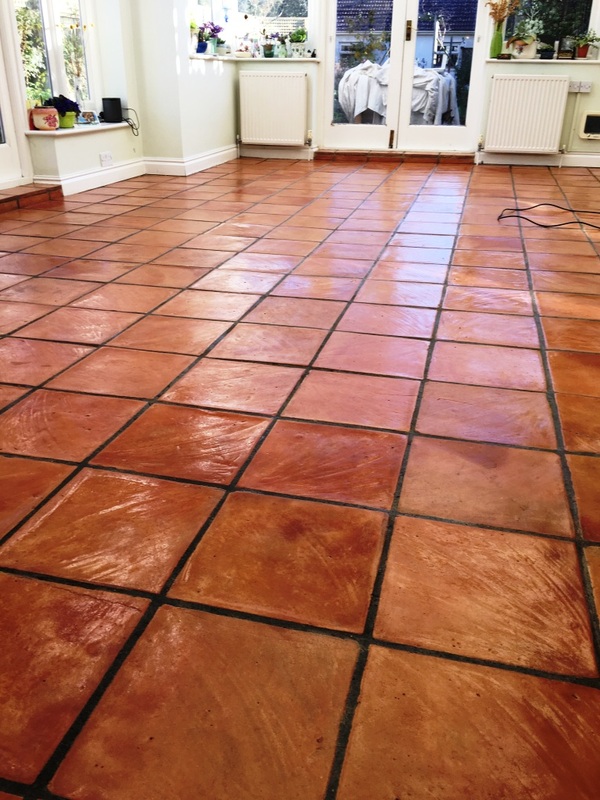 Stone Oil is a sealer which restores the colour and texture of tiled floors, as well as mechanical strength once cured. 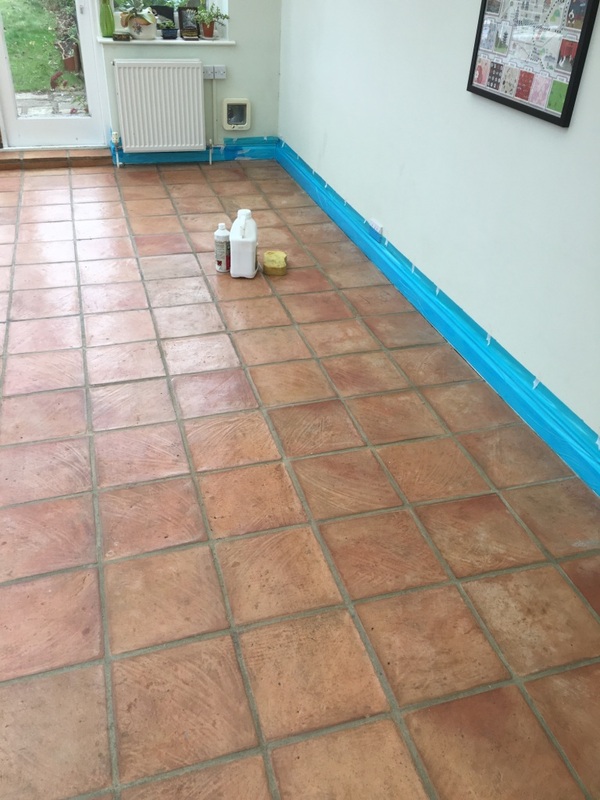 We applied a single coat of the Stone Oil before topping it up with multiple coats of Tile Doctor Seal and Go, a topical sealer which provides a high-quality sheen finish to help accentuate the appearance of the Terracotta tiles as well as adding protection. You can see the results of the restoration below. 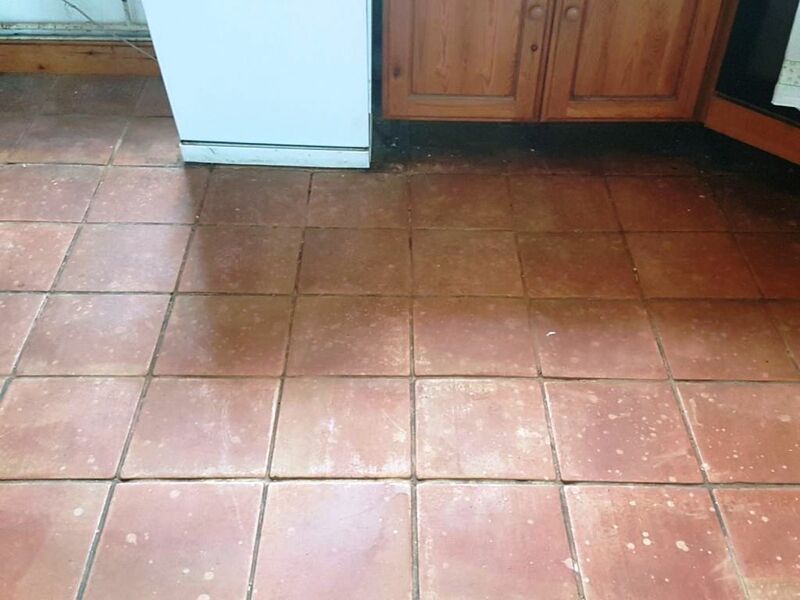 The couple were so impressed that they have now agreed to have Tile Doctor visit once a year (at a fraction of the cost of the original restoration) to complete a maintenance clean. This will make sure this Terracotta is always looking at its best! It’s very surprising how often I hear from home owners who are considering completely replacing tiled floors that can be easily be salvaged. While some people might believe that replacement is cheaper and quicker than cleaning, this is emphatically not true in most situations. 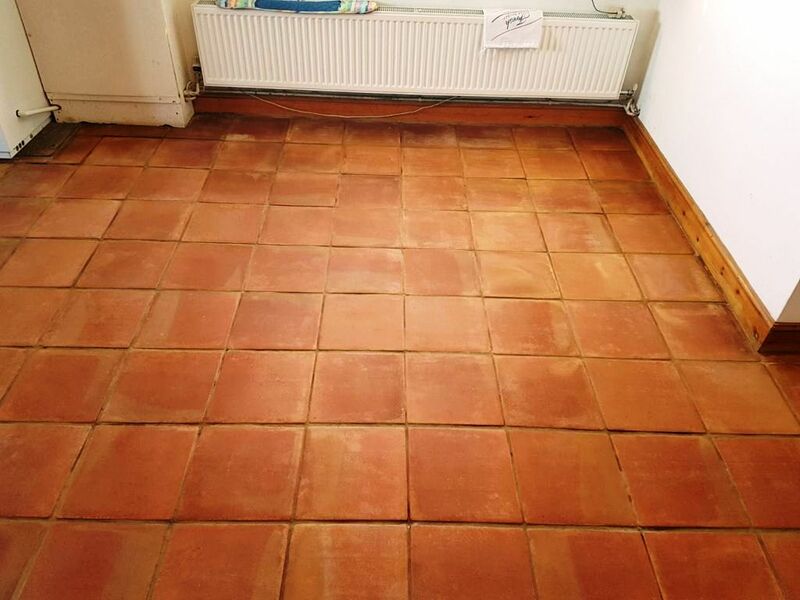 Thankfully, one of my recent customers, who lives in Kingston Upon Thames had been persuaded by her husband not to completely strip out the original Terracotta tiles in their kitchen. 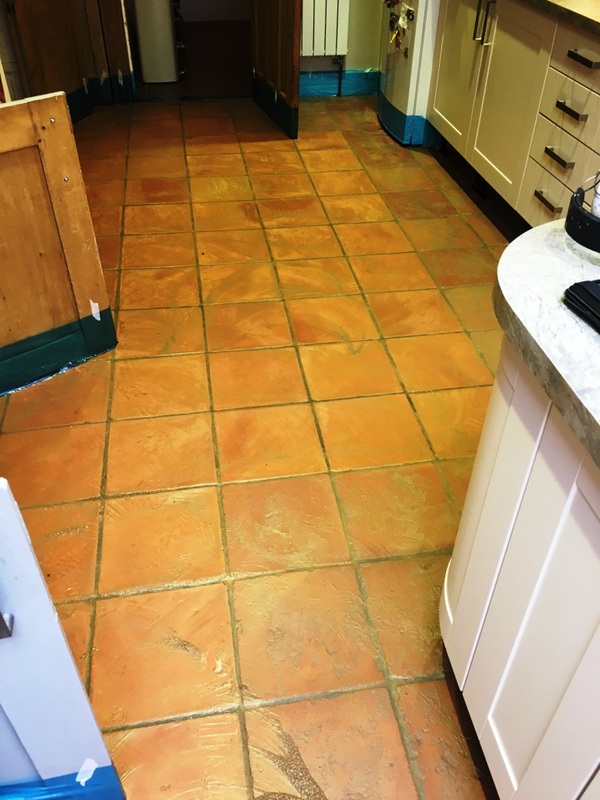 While the couple had just had new kitchen units installed, it seemed unnecessary to completely replace the Terracotta floor tiles even though they certainly needed a deep clean. Instead, they contacted their local Tile Doctor to rejuvenated the tiles to complement the new kitchen design. Before beginning, I covered all the new kitchen units with protective sheeting to prevent them from encountering water and splashes from the cleaning products. I could see that the tiles had been left unsealed for many years and this had allowed dirt and general muck to become deeply ingrained. 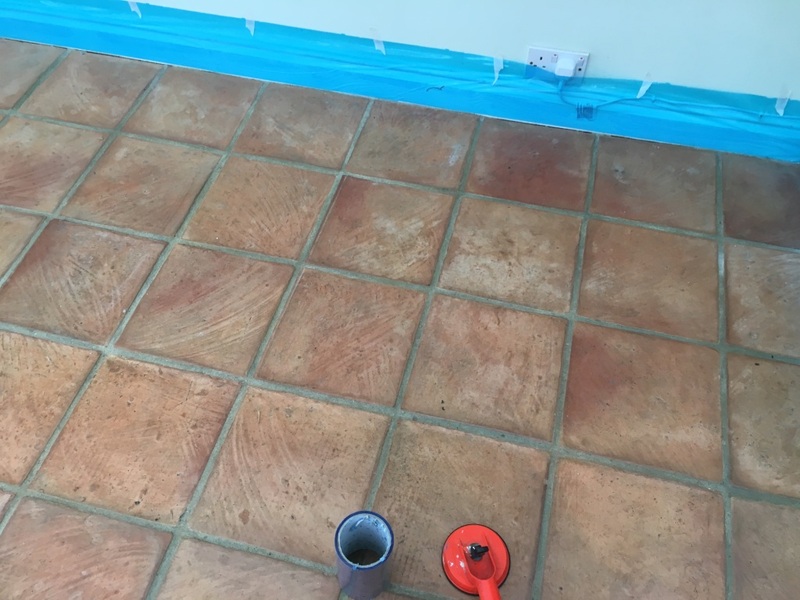 To clean the tiles, I applied a covering of our strong alkaline-based cleaner, known as Tile Doctor Pro-Clean, and left it dwell for a short period. I then attached a coarse, 200-grit diamond encrusted burnishing pad to my buffing machine and began working the product into the tiles. The burnishing pad milled away the dirty top layer of the tiles. Contrary to what some might believe, this doesn’t harm the tiles in any way, but instead polishes them. Any old sealer and dirt that the buffing machine could not reach in the corners of the room was removed by hand using diamond encrusted burnishing blocks. The burnishing process does, in fact, make quite a mess, so I promptly rinsed off the resulting slurry with more water and a wet vacuum to clear the area and leave it clean and ready to be dried. A lot of water was used during the cleaning process, so I had to leave the property for 48 hours to let the tiles dry completely. Returning to the property after those two days, I sealed the tiles using six coats of Tile Doctor Seal and Go. 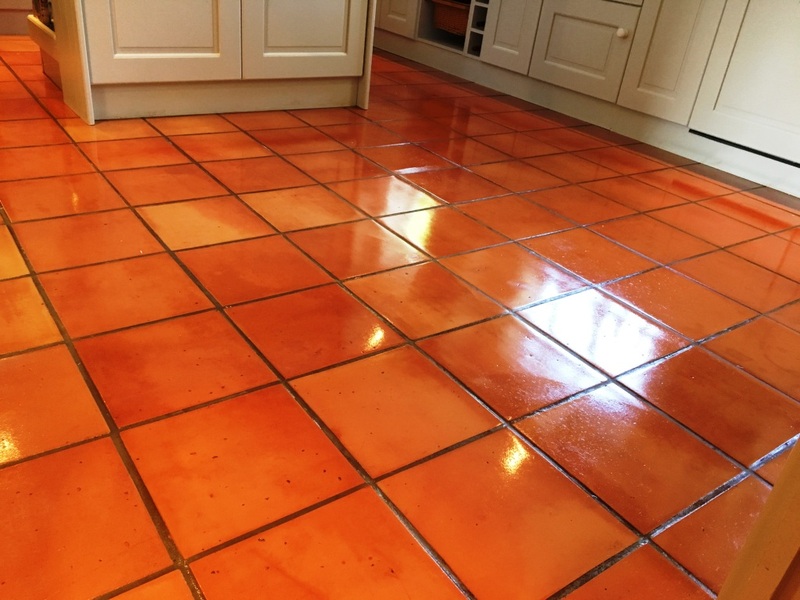 Following years of next to no protection, the floor desperately needed an effective sealer to put new life in the Terracotta and Seal and Go does that in spades by adding a lovely sheen to the tile.